Searching for new flats in Indirapuram, then you are at right place. We are real estate and property dealers in Indirapuram can provide you good options for 2,3 and 4 bhk flats in Indirapuram. We are committed to serve our clients to the best of our capabilities. We assure that you will get the best deals from us. We Know the value of your hard earned money and your genuine property needs. Indirapuram is one of the choicest and premium locations of Ghaziabad. This an urban township with good infrastructure, facilities and connectivity. As real estate agents in Indirapuram we have sound knowledge and expertise of the area. Finding the right property for you is our top priority. If you are looking for residential flats or commercial office space in Indirapuram just give us a call. 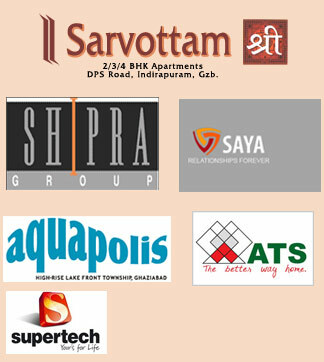 We have a wide range of options available for flats in indirapuram. If you are interested in booking new flats in indirapuram and need assistance we are here to help you. What makes Indirapuram most favorable location for home buyers? Great Location: Indirapuram is close to Delhi, Ghaziabad, Noida, and Noida Extension. It is an out and out residential township of skyscrapers with ultra modern facilities. 24 hour Power Back Up: Indirapuram has 24 hour power back in all the society flats. So power cuts are hardly bother to residents of Indirapuram. Best Malls and Shopping Complexes: Indirapuram has one the best shopping complexes in Delhi NCR. Shipra Mall, Aditya Mega mall and Jaipuria Mall are center of attractions in Indirapuram.